Four months after the murder of a post-graduate student of Nassarawa State University, Cynthia Osokogu by four men, five suspects have been arrested in Lagos for drugging and robbing commercial bus passengers at various points in the metropolis. 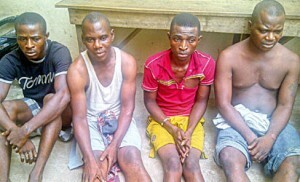 The suspects, Chibuike Mbakwe, Tochukwu Eze, Ifeanyi Okeke, Chidi Eze and Okechukwu Mbakwe are said to be members of a syndicate that specialises in robbing unsuspecting passengers in commercial buses by offering them sachet water laced with sedatives. Last Tuesday, Chibuike, Eze and Okeke boarded a commercial bus in company with four others in the Ikeja area and headed for Yaba. Unknown to them, it was in the same bus that they robbed a sedated passenger the previous week. Also, they were unaware that the driver of the vehicle had reported the incident to the Sabo Police Division and he had been advised to watch out for a future occurrence. Little did this driver know that fate would bring the same group of robbers into his bus again. CRIME DIGEST gathered that the leader of the gang, a 30-year-old suspect known simply as Chioma, is currently on the run. Usually, his method is well rehearsed. He would sit close to his victim and beckon on another member of the gang who pretends to hawk sachet water by the roadside. Chioma would then purchase a sachet of water with N20 and ask for a balance of N10. When the hawker hesitates, Chioma would buy another sachet and offer it to his victim on the pretext of not wanting to forfeit the balance. Naturally unaware that it had been tampered with, the victim would accept the offer and drink the water. Everything happens within a few minutes. As expected, after about 10 minutes or so, the victim becomes drowsy and eventually falls asleep. Everything of value in the possession of the victim is then stolen by Chioma who later alights from the bus before its final destination. In an interview with CRIME DIGEST, the suspects said the effects of the sedatives usually wore off after three hours. Describing how he got involved with the gang, Chibuike said, The leader of our group is Chioma. I met him in Alaba market in 2011. At the time, I was trading in phone accessories. After we became friends, he told me how he was able to rob people by sedating them. Eventually he convinced me to abandon my trade and join his gang. Chioma always picked his victims. I dont know how he chooses them. All I did with the rest members of the gang was to gang around the bus park with him and board the same bus with him. This will enable the bus to fill up faster and our presence close to Chioma also provides cover for his activities. I have no idea how the sachet water is laced with sedatives. A full bag, except one sachet of water is usually laced with sedatives and packaged before it is brought to the park. Unfortunately, he was unable to identify what substance was mixed with the pure water. Okeke was identified as the hawker in the gang. Only last year, he had returned to Lagos from his hometown in Anambra State. He said, After I returned to Lagos, I worked with some drivers who smuggled rice and other items from the Seme border into Lagos as a bus conductor. On our way back to Seme, we would pick up passengers. About a month ago, Chioma and his gang boarded the vehicle conveying me. While we were on our way to Seme, I noticed Chioma carefully searching his victims pockets and stealing their money. I was surprised and wanted to raise the alarm, but he silently pleaded with me not to talk. He took my phone number and promised to settle me. When we met a few days later, he gave me N500 and persuaded me to join his gang. He said it was a lucrative venture. I believed him and abandoned my job. Yet, all I got in the month I worked with him was N8,000 and two Visa brand cell phones. I was making far less than what I earned while on the Seme route. I believe Chioma was cheating me. Before every outing, Chioma would meet me somewhere and give me a bag of sedated pure water to carry. I would then accompany the group to the motor park of their choice and hang around any bus they board until Chioma calls on me, Okeke said. However, Chidi denied his involvement with the group. I admit that I was once involved in this trade. But since I returned from Kirikiri prison a few months ago, I have gone back to selling phone accessories. I dont play this trick anymore. It was on Tuesday evening that I learned from Okechukwu through a phone call that my brother had been arrested by the police, but I didnt bother because I had earlier warned Tochukwu of the consequences of his actions. I was surprised when in the early hours of Wednesday morning; some SARS operatives came into my compound with Tochukwu and Chibuike. They had come to arrest me. The Commissioner of Police in Lagos State, Mr. Umaru Manko, confirmed the arrests, adding that the gang was apprehended by members of the National Union of Road Transport Workers in Ikeja. He said, They were about seven in number at the time and had boarded a bus which unknown to them, they had boarded the week before. The driver was already on the lookout for them, but it was the conductor who noticed that the same group of persons had boarded the bus before. When he raised the alarm, other members of the NURTW present at the scene tried to round them up. The prime suspect, Chioma, fled with three others. Efforts are being made to track them down. Although Chidi and Okechukwu were not present at the scene, they have been identified as members of another group involved in the same crime. When Chibuike came to stay with his elder brother, Okechukwu admitted taking Chibuike along for a bus ride to CMS with another colleague, Goddy. Goddy had tutored Okechuwku in the trade at Cotonou where he formerly resided. Chibuike watched as his brother and Goddy practiced their art on their unsuspecting victim and coming away with a laptop and phone. Both Chidi and Okechukwu have been previously arrested, tried and remanded in prison for this same offence. While Chidi had served time at Kirikiri prison, Okechukwu served time at Ibarra prison. All suspects will be charged to court at the conclusion of our investigation.